Daesh, PYD/PKK, FETO, all terror groups: Turkish min. A senior Turkish minister said Monday that Ankara saw no difference between Daesh, PYD, PKK or the Fetullah Terrorist Organization (FETO). “Therefore, we are not entering there [in Syria] to fight a terror organization and gain ground on another terror organization,” Turkish EU Minister and Chief Negotiator Omer Celik said Monday, speaking at a news conference with Dutch Foreign Minister Bert Koenders, in Ankara. He was referring to comments made by U.S. President Barack Obama’s Special Envoy for the Global Coalition to Counter Daesh, Brett McGurk, who has said Monday that the U.S. found clashes with PYD in areas where Daesh is not present “unacceptable and a source of deep concern”. The Turkish minister also said that those who do not want Turkey to clash with other terror organizations other than Daesh, should “eliminate” these terror organizations themselves. 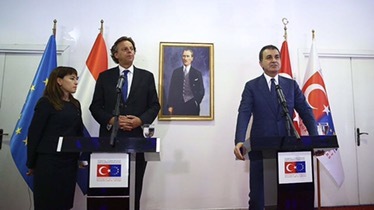 Celik thanked Koenders for immediately condemning the coup attempt and for the solidarity the Netherlands had shown. Koenders, for his part, said he was shocked to see the “brutal and bloody” coup attempt of July 15, but was “impressed to see the determination of the people of Turkey who took to the streets that night to defend their democracy, right and liberties”. Turkey’s government has said the attempted coup was organized by the Fetullah Terrorist Organization (FETO), followers of U.S.-based leader Fetullah Gulen. The latter is accused of a long-running campaign to overthrow the state through the infiltration of Turkish institutions, particularly the military, police and judiciary, forming what is commonly known as the parallel state.